Rodeo Bull Ride for hire supplied complete with rainshelter for outdoor events. Our bucking, spinning Rodeo Bull is the perfect amusement for any Wild West themed party or event. Theres no age restriction but a minimum rider height of 4ft is applicable. The Rodeo Bull is supplied with one of our trained staff members who will operate the ride for you, organise competitions, and keep track of the best times. The Rodeo Bull can be hired for use both indoors and outdoors and a FREE inflatable marquee is provided for all outdoor events. The inflatable takes up an area of 17ft x 17ft but ideally an area a little larger than this is required. If you're hiring the Rodeo Bull for use indoors you'll need a height clearance of 9ft. If outdoors and using the inflatable marquee then you'll need an increased area of 23x23ft. The Rodeo Bull is covered by our liability insurance with an indemnity limit of �5million. Because we operate the most recent model ride we don't have an age restriction like some older rides but instead a minimum rider height of 4ft applies. For riders under this height please see our Childrens Rodeo Ride which is specifically designed for smaller riders and insured accordingly. The ride has a valid safety test (its tested annually) and a Risk Assessment is available if required. 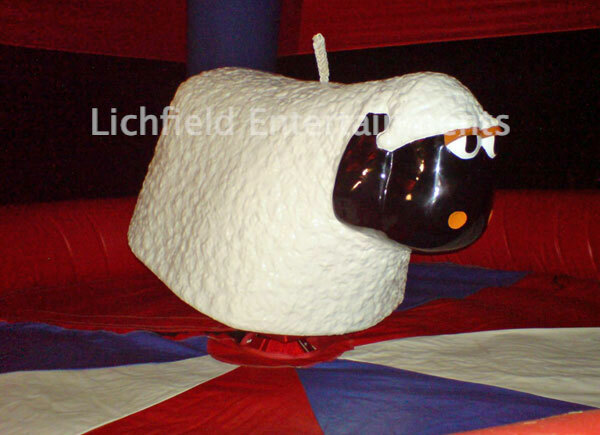 An alternative to the Rodeo Bull is the Bucking Sheep! This one always has people laughing as soon as they see it! Is it a good thing or an embarrassing thing that you can ride a Sheep longer than everyone else? Hire this ride on its own or we can bring along the Bucking Sheep attachment to any Rodeo Bull booking (at additional cost) and swap the attachments around as required. If holding a Wild West themed event also have a look at our Quick Draw, and Shooting Range games. Alcester, Alderley Edge, Alfreton, Altrincham, Ashbourne, Bakewell, Banbury, Barnes, Bedworth, Bicester, Birmingham, Bridgnorth, Bristol, Bromsgrove, Buckinghamshire, Burton upon Trent, Buxton, Cambridge, Cambs, Castle Donnington, Cheadle, Cheltenham, Cheshire, Chester, Chesterfield, Chipping Norton, Cirencester, Congleton, Cotswolds, Coventry, Crewe, Derby, Derbyshire, East Midlands, East Midlands Conference Centre, Edgbaston, Evesham, Fulham, Gloucester, Gloucestershire, Grantham, Greater London, Henley in Arden, Hereford, Herefordshire, Hinckley, Holmes Chapel, Kegworth, Kenilworth, Kettering, Knutsford, Leamington Spa, Leeds, Leek, Leicester, Leicestershire, Lichfield, Lincolnshire, London, Loughborough, Ludlow, Macclesfield, Malvern, Manchester, Mansfield, Matlock, Melton Mowbray, Meriden, Middlewich, Milton Keynes, Nantwich, Newark, Newcastle under Lyme, Northampton, Northants, Nottingham, Nottinghamshire, Notts, Oswestry, Oxford, Oxfordshire, Redditch, Rugby, Sandbach, Sheffield, Shrewsbury, Shropshire, Solihull, South Yorkshire, St Georges Park, Stafford, Staffordshire, Staffs, Stoke on Trent, Stratford Upon Avon, Stroud, Sutton Coldfield, Tarporley, Telford, Telford Exhibition Centre, Uttoxeter, Warwick, Warwickshire, Welshpool, West Midlands, Whitchurch, Wolverhampton, Worcester, Worcestershire, Worksop. Hire the Rodeo Bull and/or Bucking Sheep Ride and we will allow a discount on any other piece of equipment hired at the same time!